You’re Living All Over Me (1987) – Critics call this J Mascis’s best work, but of course they’re wrong. The guitar tones and playing are gorgeous, and this thing certainly influenced fellow indie guitar virtuoso Doug Martsch of Built To Spill, among others. But some of these riffy, jammy songs don’t really go anywhere. Not to say that they’re dull but rather that they don’t feel meaningful, and meaning is what makes J’s best writing so special. The best ones are the shorter, poppier tunes: “Little Fury Things” is the weirdest, with an echoed screaming intro leading into Lee Renaldo’s sweetly sung chorus and J’s verses about rabbits and squirrels and such. Maybe it’s a metaphor or maybe he’d just read Watership Down. “In A Jar” is a metaphor but it works better when taken literally, as a cute narrative of a neighborhood alley cat: “I’ll be grazing by your window/Please come pat me on the head/Just wanna find out what you’re nice to me for.” And “The Lung” is a deceptively simple three chord burnout anthem that encapsulates what’s great about early Dinosaur Jr more than any other song on here. Lou Barlow adds the dreadfully bad “Poledo,” which is odd considering his prolific work with Sebadoh et al. He wouldn’t really come into his own until Sebadoh’s “Gimmie Indie Rock” 7″ and then the J Mascis diss track “The Freed Pig.” Good album, but for a real Dinosaur Jr classic, look elsewhere. Green Mind (1991) – J’s best set of tunes unfortunately let down by his own paper thin production. The whole sound has been squashed and flattened, and I suspect that even the remastered version can’t do much to help this compromised recording. No matter, the songs are great and the playing is superb, mostly J on his own as a one man band. “The Wagon” is the best car song ever, better than anything by the Beach Boys, Springsteen, Prince, whoever – although I might say Dr Dre’s “Let Me Ride” is close. It’s bursting with hooks and clever ideas, like a mid-60’s Beatles single updated for the 90’s indie rock crowd. You have to love the medley of “Blowing It” and “I Live For That Look,” cleverly bridged by a soaring little guitar solo; “How’d You Pin That One On Me,” which sounds like Superchunk; and the darker, cautionary “Water.” You don’t have to love the turgid “Thumb,” a truly awful mellotron assisted dirge that suffers the most from the layered solo instrumentation. It’s a bad song, but J must like it because it shows up a lot on live shows and other releases. The title track is a great teen suburban anthem of burnout ennui: “On a certain level I think they’re great/But on another I can’t relate…I’ve just begun to forget why I seldom try to break out of their scene.” Social anxieties, peer pressures, smoking weed – “It’s a shame to let it slide knowing either way I haven’t tried/Can’t figure out where it all stands/In the green mind.” Yeah, this album kind of spoke to me in high school, just a little bit. Where You Been (1994) – This is the classic. A phenomenal album, with a big sound that isn’t so much a capitulation to radio as it is simply an expansively produced classic rock album. These songs are too smart for radio anyway. Lots of folks heard Neil Young in the ballads while lots of other folks used to show off their guitar chops with the intro riff to “Start Choppin'” – but everybody with good musical taste, from indie to punk to classic rock fans, dug this album. Every song is well crafted, with lots of turns and neat little sections, all stretched out with memorable riffing and soloing in among the full spread out mix (there’s even bass on this one – hey Green Mind, wha happened?) It’s an epic album. “Not The Same” is the dirgey Neil Young ballad that “Thumb” wanted to be; “Get Me” and “Drawerings” are basically the same song, but it’s cool because they’re right next to each other and it’s still a damn good folky shuffle; and “Goin’ Home” is the prettiest of them all, with a Dylan-y acoustic and organ mix and typically lovelorn lyrics: “In the place you said you’d meet me/I don’t see you hanging ’round.” Some of these lyrics are so sad and plaintive that they might be mistaken for emo with a lesser vocalist, but J is so unique, somehow uncaring yet still triumphant in his casual drawling of these endless personal anxieties. Yeah, he’s bummed out, but he can always go home to smoke weed and play guitar. So it’ll all work out. Oh, and there’s a Beastie Boys “So Watcha Want” reference hidden on here too. Love it. Whatever’s Cool With Me (1990) – Essential. 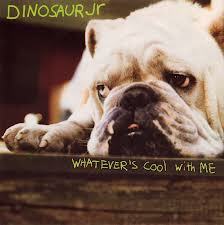 Might be easy to overlook (despite its adorable bulldog cover) but this is a great EP of near peak J Mascis material. “Whatever’s Cool With Me” wants to be “The Wagon part 2” and doesn’t quite make it, but it’s a fun song. “Not You Again” recalls the early poppy sound while “Pebbles + Weed” recalls the even earlier pre-Jr days, both evincing the clever songwriting tricks he’s picked up since. But the best is “Quicksand,” a reconfigured Bowie cover that neatly incorporates the riff from “Andy Warhol” from the Hunky Dory album as well. This one is miles better than Bowie’s original, which was stiff and creepy with its fascist baiting lyrics; J changes it to a suburban setting (“I can’t believe the wagon’s gone/It’s history”) with more common 90’s teenage concerns (“I’m a twisted name on Uma’s eyes/I’m living proof of Cindy’s lies – It’s destiny”) and a few indie rock shoutouts (“Should I leave the engine on to listen to that ‘Mountain Song’?…If I don’t explain what you oughta know/You can tell me all about it at the next BALL show”). It’s one of J’s finest moments. Also, “Thumb” is on here too, but it’s real easy to skip that one. Beyond (2007) – After several band albums of diminishing returns and some solo work that felt competent but hardly vital, the original group reformed for this stunningly strong comeback. It’s like nothing ever changed, god bless them. This feels like the real modern follow up to You’re Living All Over Me, with the playing and songcraft matured and refined. It’s still loud and quite raw, without the additional instrumentation and production tricks of J’s “solo” Dino Jr albums, but there’s still lots of complexity to this material. “This Is All I Came To Do” is their catchiest song this side of “Freak Scene” and perfectly captures the perfectly modest triumphs of this record. We wanted the old band, playing the old kind of stuff, and that’s exactly what we got. A modern Dino Jr classic, and probably the original Barlow/Murph group’s finest work. Just don’t tell the critics.